Atheist Monkey: Yeeaahh... we reached our goal of $50,000!! I'm so proud of everyone. We have reached our 2008 year-end goal of $50,000!! But WAY early... we did so much better than I original predicted and I'm very proud of everyone for being a member of the team and helping to show that "reality-based" thinkers have compassion and are excited to shape the world to be a better place. So what now? Let's keep up the pace and maybe try and turn it up a notch. We raised about $1,250 per day since the team started. At that pace we should be able to raise a total of $150,000 by year end. So to me that next goal just makes sense. What are your thoughts? Feel free to leave a comment. Along with our goal to raise $150,000 in loans through our team by the year end of 2008, I thought of another side goal we can pursue. We slipped in the rankings from #2 to #3. We are still doing well at trying to catch Kiva Friends but we need to turn things up a notch to catch Kiva Christians (in total money loaned). Kiva Christians had a lot of help from one of their members which may be a church. I for one am happy that a church has focused their funds towards Kiva. I wish all churches would do that. Some teams may get a short term boost from one big member but we still have a lead in the number of team members and we can use that to our advantage. 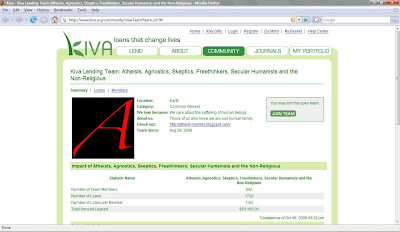 Kiva Christians has a loans per member ratio of 5 and ours is 1.8. I think we can increase our loans per members and I think our target for the year end of 2008 should be 3 loans per team member. Of course, it's voluntary and we welcome and are happy to have members who can only make 1 loan but some of us are addicts and we'll make more than 10. But setting a loans per members goal can be a great way to rally for more loans and to have fun. It may also encourage some of our team members who have joined multiple teams to rally their loans to our team until we reach this loans per member goal. Thoughts? I think that $150,000 is a great goal, it gives us all something to stretch for! I made two loans recently, and I am sure I can make another by year's end. I will be getting some credits from loan payments, but I can also save a little bit here and there from my grocery and gas budget. It should not be too difficult to pull together $25 with just a little bit of effort! Is it okay to admit that when you signed a post "Your Captain Pete" I immediately thought of a pirate with a peg leg, and it made me laugh? No offense intended, I just thought you might enjoy a good laugh, too!